The final reckoning has come. The future of the Land will be decided now, written in the blood of men. After his pyrrhic victory at Moorview, King Emin learns the truth about the child Ruhen. Powerless to act, he must mourn his friends and watch his enemy promise a new age of peace to the beleaguered peoples of the Land. While the remaining Menin troops seek revenge, daemons freely walk the Land, and Ruhen's power grows, a glimmer of hope remains. One final, desperate chance for victory remains and failure has become unimaginable. The fanatical rulers of Vanach hide a secret at the heart of their nation; a weapon so terrible only a dead man could wield it and only a madman would try, but without it Narkang will be obliterated. The past year has taken a grave toll and Ruhen's millennia-old plans are about to bear terrible fruit. There can be only one outcome if he continues unchecked: total dominion over the Gods themselves. Tom Lloyd was born in 1979 in Berkshire. After studying for a degree in International Relations he went straight into publishing, where he still works. He never received the memo about suitable jobs for writers and consequently has never been a kitchen-hand, hospital porter, pigeon hunter or secret agent. He lives in Oxford , isn't one of those authors who gives a damn about the history of the font used in his books and only believes in forms of exercise that allow him to hit something. Visit him online at www.tomlloyd.co.uk. 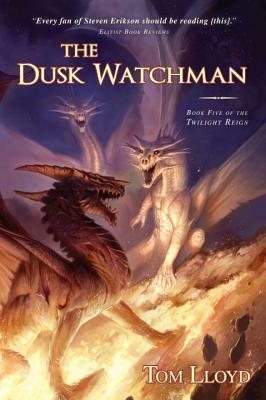 "Lloyd's Twilight Reign contains all the things we feel are lacking in the Wheel of Time. Danger. Death. Consequences. . . . If you aren't reading this series, you are doing yourself an immense disservice."